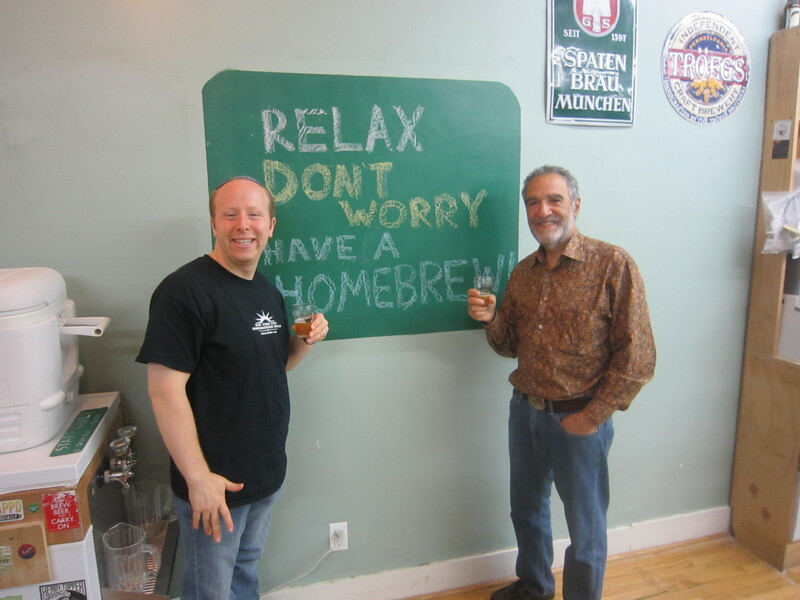 Brewed – promoting the artistry and passion behind craft beer and homebrewing. Palate – sharing my beer related experiences with the craft beer and homebrewing communities as I continue to enjoy the never ending journey of developing my palate. I am a 30 year old homebrewer and craft beer enthusiast living in Elizabeth, New Jersey (after 11 years in NYC). My craft beer journey started when I began trying Belgian, German, and other international beers while living in Israel for 2 years after High School (2004-2006). Since then I’ve developed a passion for developing my palate and sharing my experiences with others. This passion has been bolstered and enhanced by my home-brewing which I’ve been doing for 7 years (more consistently over since getting married in July of 2013). That being said my opinion is that each beer (commercial or home-brew) represents a new experience in developing your craft beer palate and not a way to “one-up” your fellow craft beer drinkers. To quote John Holl, editor of All About Beer magazine, “What it really comes down to is enjoying a glass of beer with good company regardless of the beer’s pedigree.” In turn, since shifting my focus to developing my homebrewing skills and knowledge in November 2013, I’ve found that I enjoy the experience of trying new craft beers more because I am no longer worried about whether I’ll be able to try the latest beers that avid craft beer drinkers are clamoring over. Next, in terms of my palate…Although I am a hophead and India Pale Ale is my favorite beer style, I enjoy drinking pretty much every style under the sun. I have a soft spot for Belgian beers (saison is my favorite belgian beer style), German beers (especially well done pilsners, wheat beers, and doppelbocks), and barrel aged beers; some of which I buy when I’m in the mood for a “treat” or change of pace. I feel that part of appreciating what beer has to offer and developing one’s beer palate means going out of your comfort zone, and trying styles or specific beers you may have not liked that one time a friend let you try a beer that he or she swore was amazing. However, I admit that some styles are an “acquired taste”. The way I choose which beer to drink is by which beer flavor characteristic I am in the mood for e.g. roasty, hoppy, malty, spicy, complex etc. Lastly, at times I feel I need a refresher course and buy a beer from a style that I have not tried in a while, so that I can do my best to avoid getting “stuck” in my comfort zone. One of the benefits of putting in the effort to develop one’s palate through drinking and brewing craft beer is the ability to gain a deeper appreciation for other handcrafted beverages such as whiskey (whisky) and wine. In addition, one can use his or her ability to pick up on nuanced aromas and flavors in craft beers to do the same while drinking whiskeys, wines, and other handcrafted beverages (spirits etc). This has been a helpful tool in helping me plan menus for meals that I either host or attend and turn friends who usually drink wine etc. on to craft beer through food pairings. In turn, my goal for The Brewed Palate is to share as many of my home-brewing and craft beer experiences with you with hopes to enhance your personal journey through palate development and brewing your best beers. Cheers! (Last updated: 11/18/16). I chose to use a 1 to 10 scale in order to make my ratings easy to understand, and to use half point increments in order to be as honest as possible with how much I liked or disliked the beer/s being reviewed. So when a beer gets a e.g. 7.5 it means that for me landed somewhere in between a 7 and an 8 (see below for more details). 10: This rating is saved for beers that wow me on all levels (appearance, aroma, taste, mouthfeel, drinkability) and can be considered amongst my favorite beers. 9: Like the 8/10 beers those that get this rating are those that are spot on for their style. Meaning, they fit my preferences for their style seamlessly, and in most cases have an added wow factor in their flavor profile/s. They can also be considered my go-to beers in their respective styles. 8: Overtime you will see me giving beers this rating quite often. This is because to earn an 8/10 a beer has to be “spot on for its style” and successfully display the aim of its brewer. With both these factors in play the beer should have an aroma and flavor profile that keeps me interested from start to finish. 7: These beers are ones that I feel are above average for their style, but lack the wow factor that inspires me to strongly consider purchasing them again at a bar or beer store. 6: Just above the halfway mark of my 1-10 scale are beers that have some interesting flavors, but lack complexity i.e. flavors that stick out as impressive to my palate. They may also be lacking in their appearance, aroma, and mouthfeel characteristics. 5: At this point in my scale the impressionable ability of a beer begins to decline. Though at a 5/10 I might be able to recommend a beer to someone who is new to craft beer or beer drinking in general. I would never recommend a 5/10 to an experienced craft beer drinker. 4: As a craft beer drinker and advocate I hope that no craft beer that I try will be bland or off putting enough to get a 4/10 or lower. In the case of this rating a beer is drinkable, has peeks of likable flavor, and has no off putting characteristics in its aroma and or taste. Having said this, beers from here down will never be recommended unless one is either outdoors on a hot day without access to good beer, or at a party or bar that has no craft beer whatsoever. 3: Drinkable with minimal off putting characteristics e.g. an unappetizing aftertaste. “Fizzy Yellow Beers” – Mass Produced Lagers. 2: On the cusp of being undrinkable. 1: Since I do not have a 0/10 in my scale these beers are undrinkable. Anyway, you seem to recommend a lot of beer that I can only get online. Unfortunately they only offer these beers in cases. I’m going to try the Weihenshaphaner Pilsner soon though! I haven’t had a good pilsner in a log time and you make it sound like the best thing ever. Cheers! Glad you found and like my blog. Where are you from? You should definitely try the Weihenshephaner Pilsner. I was blown away when I tried it. They recently came out with a pale ale, which I hope to try soon. Good to meet you tonight at Total Wine in West Orange. While I regret that our Dogfish Head IPA are not as fresh as you’d personally prefer; nonetheless, I am confident they are delicious. You might not prefer what age does to certain beers, but you don’t have to worry about beer going bad. That last point resonates with me. While many wine lovers can certainly appreciate the bright stonefruit and limeade sweetness of many a Mosel Riesling, few will enjoy a more developed secondary character redolent of mineral and reductive (in a good way) complexity, attainable through ageing in non-extreme environments. In any case, I do appreciate your feedback and am looking forward to serving you again. I will try a comparison tasting of the 60 minute, now and in a few months… Will let you know which I prefer! I particularly enjoy the floral character that hops imparts, and find that the Dogfish 120 is one of the most balanced IPA’s out there, with a focus on more than just hop bitterness… rather its other phenolic virtues. Stone seems to hold bitterness as somewhat of a sole virtue of hops… all other components coming a distant second. That said I can appreciate their 3 month enjoy by date… ensuring that the bitterness remains intact and center-stage. Hard to wrap my head around a focus on bitterness… While I certainly enjoy it. For me, one-dimensionality can never be a virtue when it comes to the “appreciation” of liquid culture/food. The most important issue here is that even the most beer geek frequented stores are not always able to sell their stock of IPAs when fresh (hop aroma and flavor are at their peek). So when you disagreed with my brother this factor is what dictates the issue my brother raised at Total Wine and not a difference of opinion on taste preferences / characteristics or the history of IPAs. Hence, I won’t make a judgment on your craft beer sales because I don’t know how they’re doing or have been doing ever since TW started carrying a larger variety of craft beers. Also, arguments are usually not necessary and if they happen both sides should be able to focus on the reality of the situation before things take a turn for the worst. Dogfish Head 120 has great hop character when fresh, but becomes quite sweet as it ages. Its balance exists within the first few months after bottling. Stone’s enjoy by date also protects hop aroma and flavor which tend to fade first. When fresh Stone’s hop forward beer tend to have great floral and citrus aromas and flavors. In addition, at special Stone events double dry hopped versions of their IPAs are frequently served to showcase the potential of hop flavor in an IPA. Lastly, in general IPAs that have a nice amount of bitterness (not overwhelming, but appropriate for the style) are great for food pairings (contrasting sweet flavors and complementing spicy flavors). If Stone’s (or other breweries’) IPAs are too bitter for you or not what you prefer; then thanks to the variety of craft beer available in our area, you have plenty of other IPAs etc to choose from.